Definition at line 32 of file GCNHazardRecognizer.h. Definition at line 34 of file GCNHazardRecognizer.h. Definition at line 39 of file GCNHazardRecognizer.cpp. Definition at line 235 of file GCNHazardRecognizer.cpp. References llvm::ScheduleHazardRecognizer::getMaxLookAhead(), llvm::SIInstrInfo::getNumWaitStates(), llvm::MachineInstr::isDebugInstr(), llvm::MachineInstr::isImplicitDef(), and llvm::MachineInstr::isKill(). Definition at line 85 of file GCNHazardRecognizer.h. References AdvanceCycle(), EmitInstruction(), EmitNoop(), getHazardType(), PreEmitNoops(), PreEmitNoopsCommon(), and RecedeCycle(). Definition at line 51 of file GCNHazardRecognizer.cpp. Definition at line 55 of file GCNHazardRecognizer.cpp. Definition at line 231 of file GCNHazardRecognizer.cpp. Definition at line 124 of file GCNHazardRecognizer.cpp. References llvm::SUnit::getInstr(), llvm::MachineInstr::getOpcode(), llvm::GCNSubtarget::hasReadM0MovRelInterpHazard(), llvm::GCNSubtarget::hasReadM0SendMsgHazard(), isDivFMas(), llvm::SIInstrInfo::isDPP(), llvm::SIInstrInfo::isFLAT(), llvm::MachineInstr::isInlineAsm(), isRFE(), isRWLane(), isSendMsgTraceDataOrGDS(), isSGetReg(), isSMovRel(), llvm::SIInstrInfo::isSMRD(), isSSetReg(), llvm::SIInstrInfo::isVALU(), llvm::SIInstrInfo::isVINTRP(), llvm::SIInstrInfo::isVMEM(), MI, llvm::ScheduleHazardRecognizer::NoHazard, and llvm::ScheduleHazardRecognizer::NoopHazard. Definition at line 175 of file GCNHazardRecognizer.cpp. 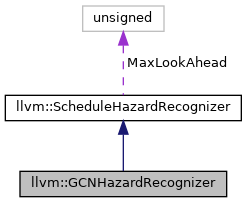 Definition at line 180 of file GCNHazardRecognizer.cpp. References MI, PreEmitNoopsCommon(), and llvm::RISCVFenceField::W.
Definition at line 188 of file GCNHazardRecognizer.cpp. References llvm::MachineInstr::getOpcode(), llvm::GCNSubtarget::hasReadM0MovRelInterpHazard(), llvm::GCNSubtarget::hasReadM0SendMsgHazard(), isDivFMas(), llvm::SIInstrInfo::isDPP(), llvm::SIInstrInfo::isFLAT(), llvm::MachineInstr::isInlineAsm(), isRFE(), isRWLane(), isSendMsgTraceDataOrGDS(), isSGetReg(), isSMovRel(), llvm::SIInstrInfo::isSMRD(), isSSetReg(), llvm::SIInstrInfo::isVALU(), llvm::SIInstrInfo::isVINTRP(), llvm::SIInstrInfo::isVMEM(), and llvm::max(). Referenced by atIssueLimit(), and PreEmitNoops(). Definition at line 269 of file GCNHazardRecognizer.cpp.